Gaviota State Park takes its name from the Spanish word for seagull, given to the area by soldiers of the Portola Expedition who supposedly killed a seagull while camping here in 1769. Marked by a tall Southern Pacific railroad trestle that crosses Gaviota Creek high above the day-use parking lot, the park is a popular spot for swimming, picnicking, surf fishing and camping, despite high winds that often blow through the area. A pier on the west end of the beach is used by anglers, and scuba divers and surfers use a boat hoist on the pier to access the waters of the Santa Barbara Channel. Visitors can explore the rugged upland portions of the park from a trailhead in the parking area. Ambitious hikers can climb to Gaviota Peak that offers a spectacular view of the coast and the Channel Islands. 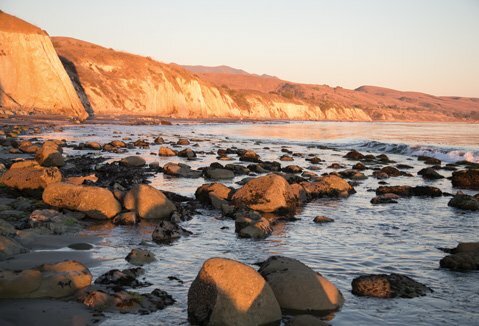 Gaviota State Park is also home to the Kashtayit State Marine Conservation Area, and boater launching from Gaviota may be able access the Point Conception State Marine Reserve. Each area has its own rules regarding fishing and the take of living marine resources. Please visit http://www.dfg.ca.gov/marine/mpa/mpa_summary.asp for specific rules regarding each area. Gaviota State Park is Currently closed for camping. Camping will re-open March 1, 2017. A project to re-align the northbound lanes and straighten a curve along US Highway 101 from north of Mariposa Reina to south of the Gaviota State Roadside Rest Area will begin on Monday, April 18, Caltrans officials have announced. For the duration of this project, motorists going northbound on US Highway 101 will be unable to turn left onto Gaviota Beach Road to access Gaviota State Park or turn left onto northbound US Highway 101 from Gaviota Beach Road. Northbound motorists will detour at the State Route 1 Interchange north of the tunnel before returning southbound. Northbound motorist leaving Gaviota State Park will have to travel south to Mariposa Reina to access northbound onramp approx. 1 mile.